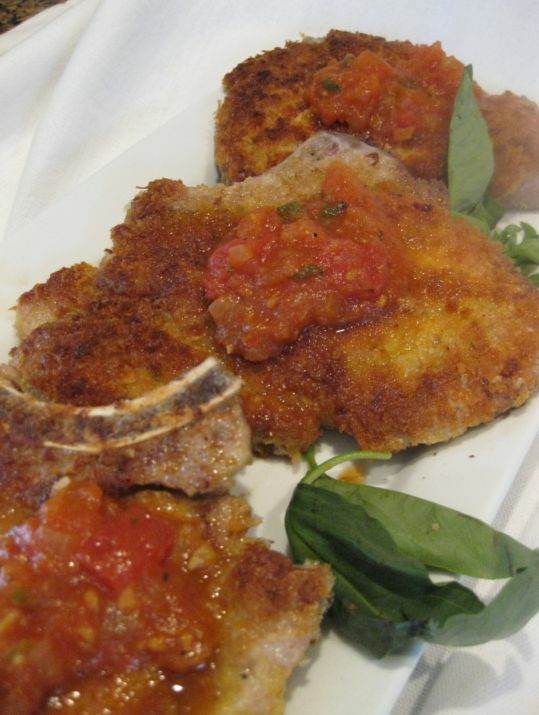 Milanese style is a preparation in which a veal or chop pork is pounded thinly, dredge in flour, dipped in egg wash, coated with bread crumbs, and then shallow-fried in oil. 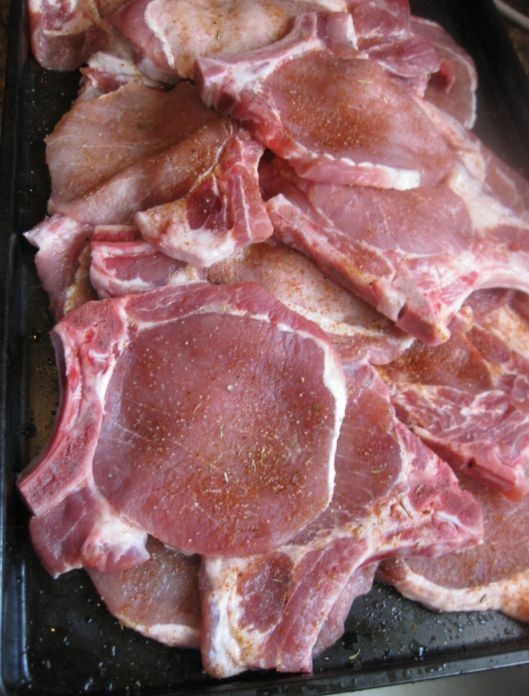 The chops in my grocery store are already cut pretty thin so they were slightly pounded, but if your chops are thick you can pound them with a meat mallet until they are very thin. The pork chops came out crispy, moist, and very tasty. 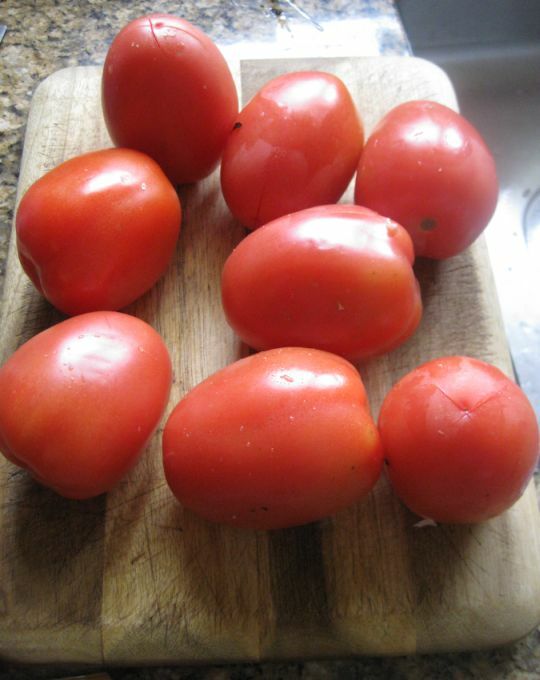 Served them with a spicy tomato sauce and buttered pasta for a heartier meal. You can replace the pork chops with chicken breast also. 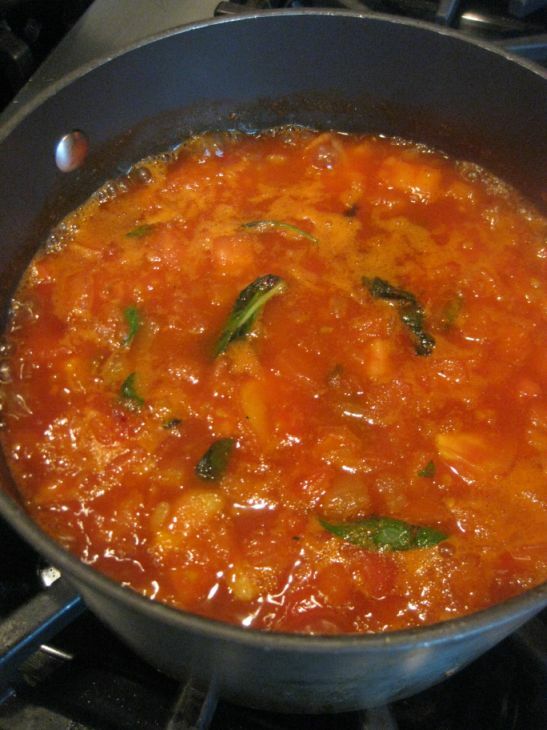 This recipe makes a lot of tomato sauce so save them for the next day and mix them with you pasta! 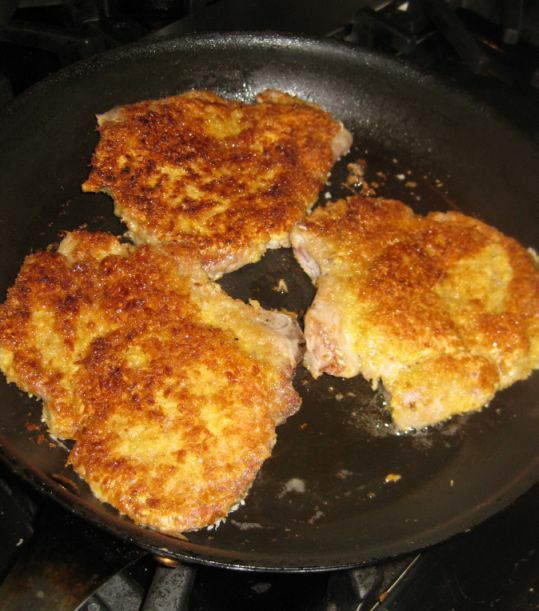 I know there a lot of people that are not crazy about pork chops but this is definitely an easy recipe to turn out a tough pork chops into the most tender pork chops you’ll ever eat. Cooking it this way the pork chops is very juicy and tender! 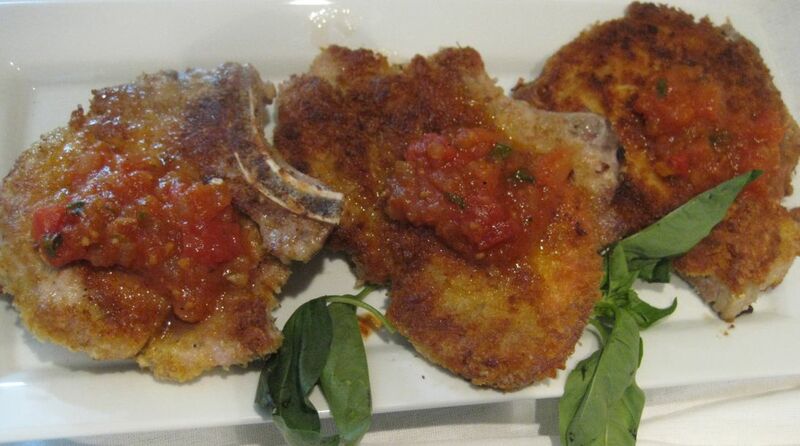 Close look at the pork chops. 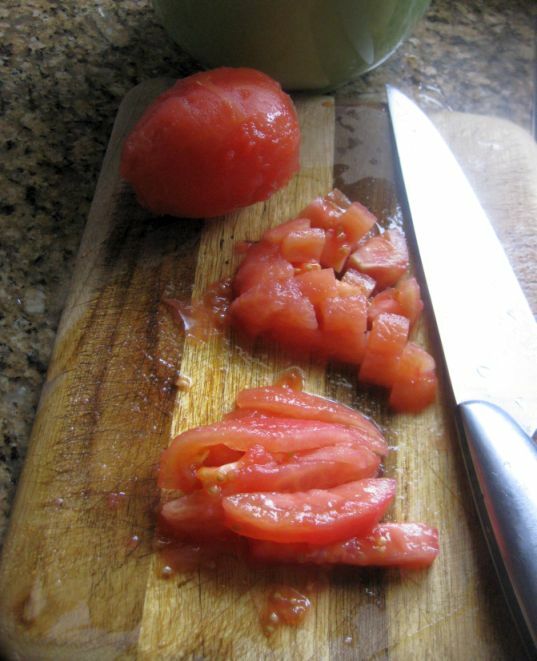 Make an X at the bottom of each tomato. 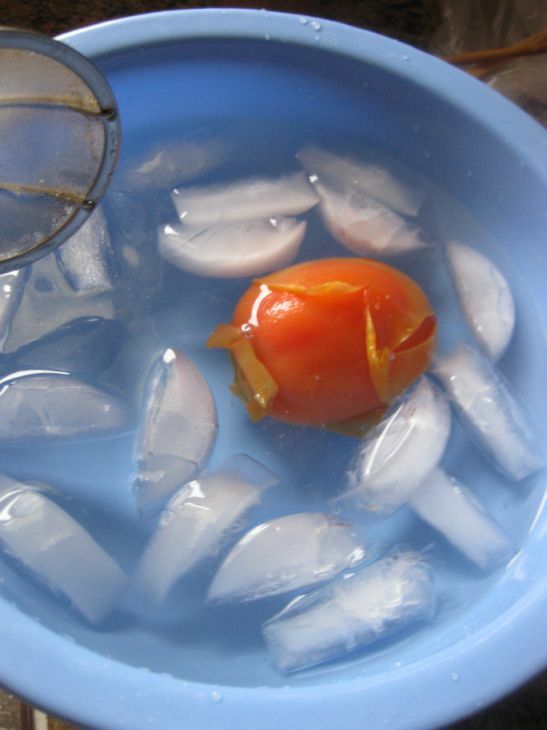 Bring a large hot pot of salted and set a bowl of ice water near the stove. 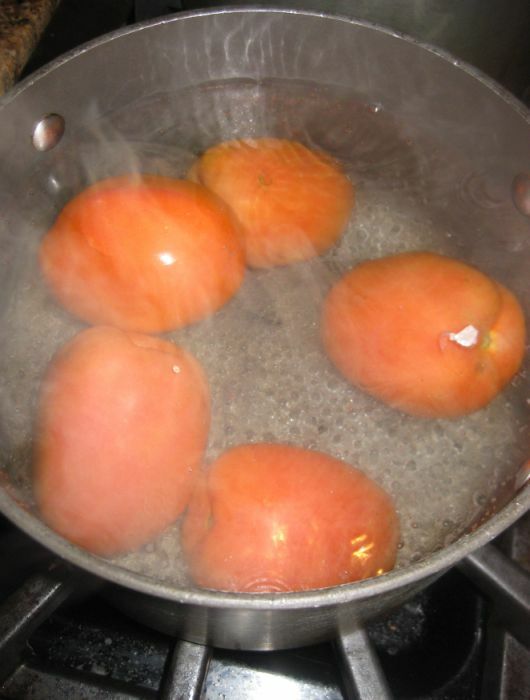 Slip the tomatoes into the boiling water and cook just until the skin loosens. About 1 to 2 minutes. 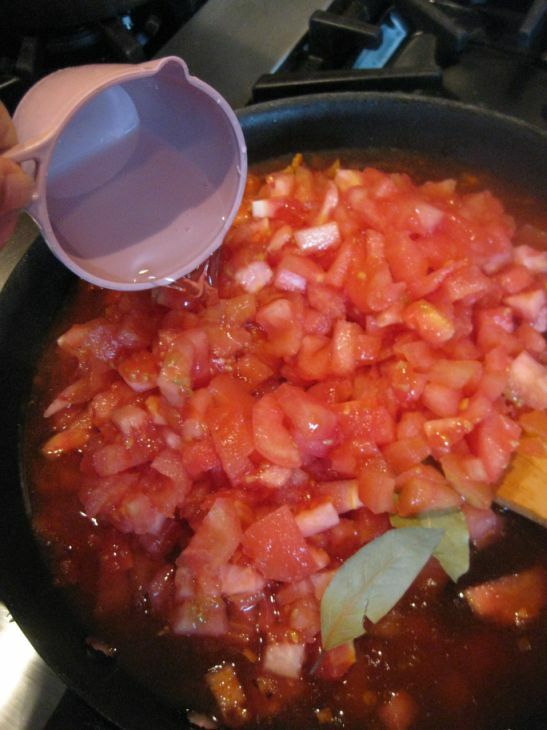 Fish the tomatoes out of the water with a wire skimmer or slotted spoon. Drop them into the ice water. 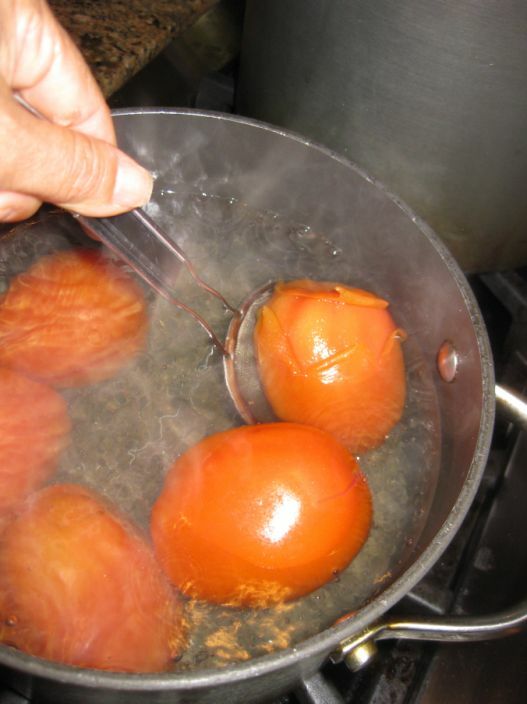 Slip the skins off the blanched tomatoes. 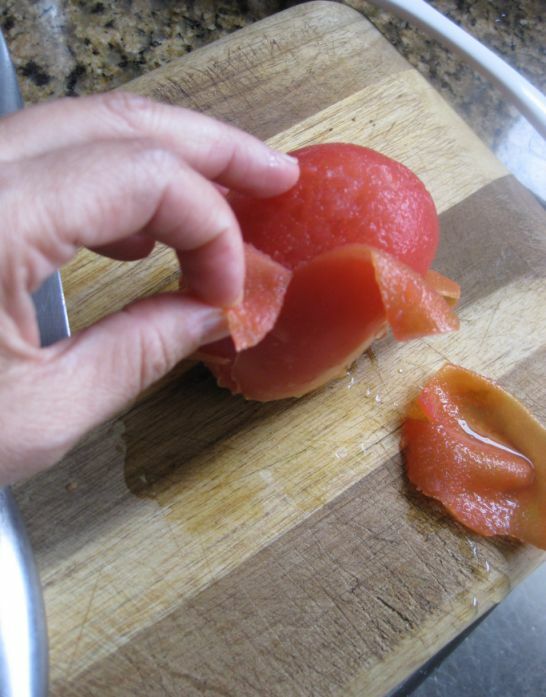 Cut the tomatoes in half, lengthwise. 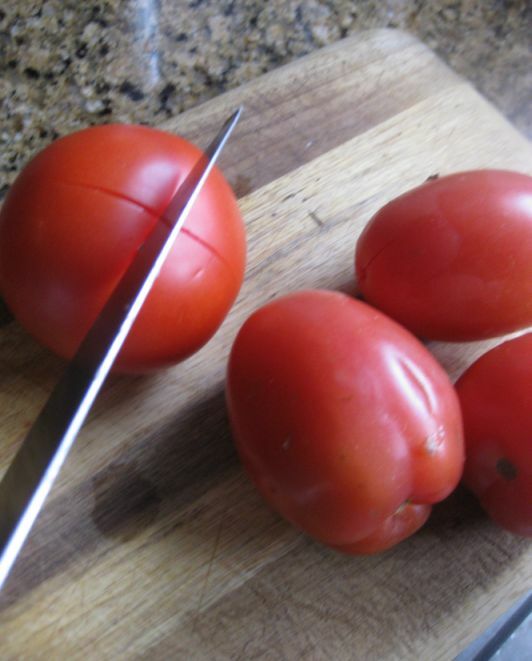 Gently squeeze of the seeds with your hands and they are ready to cut into dice. 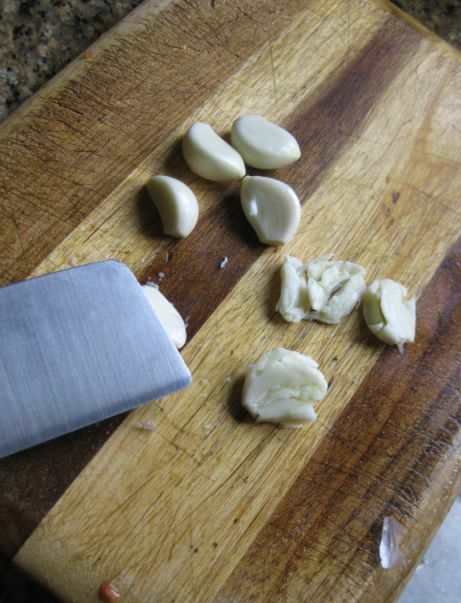 Peal the garlic and smash them with your knife and set aside. 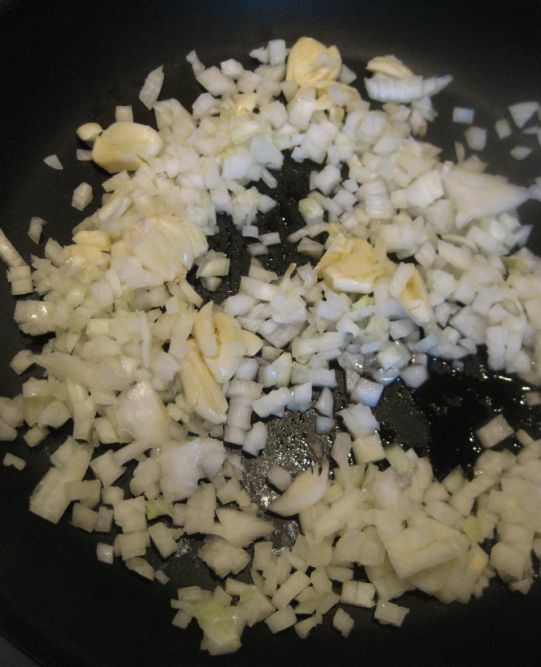 Chop the onions and set aside. Heat the oil in a medium saucepan over medium-high heat. 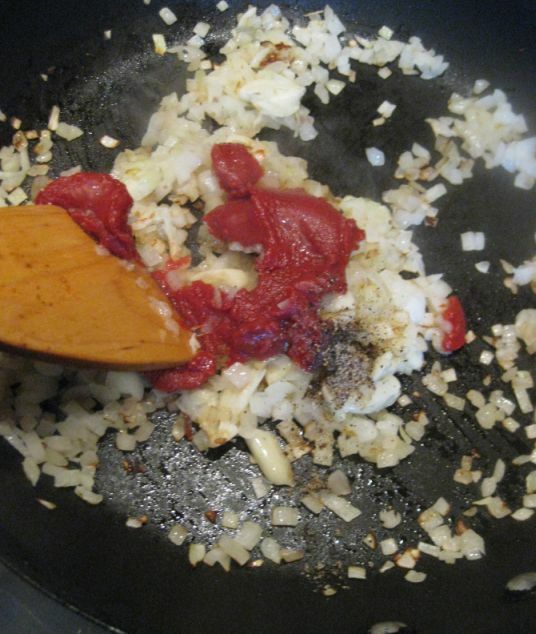 Add the onions, salt, and black pepper and sauté until the onions are translucent, about 2 minutes. 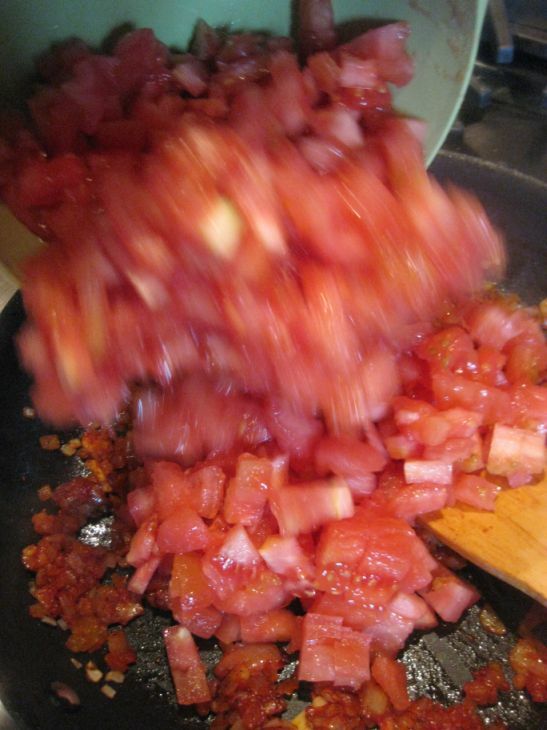 Add the garlic, and tomato paste, and cook, stirring, for 1 minute. Add the bay leaf, and chicken stock or water, and bring to a boil. 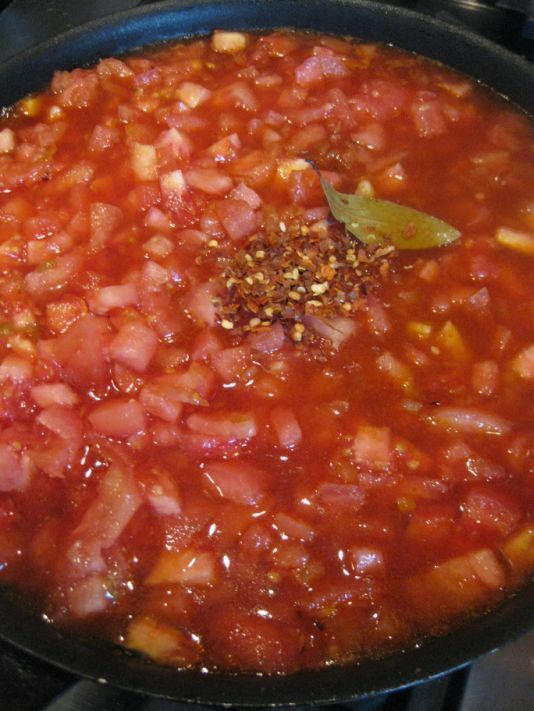 Reduce the heat and simmer, stirring occasionally, for 30 minutes. 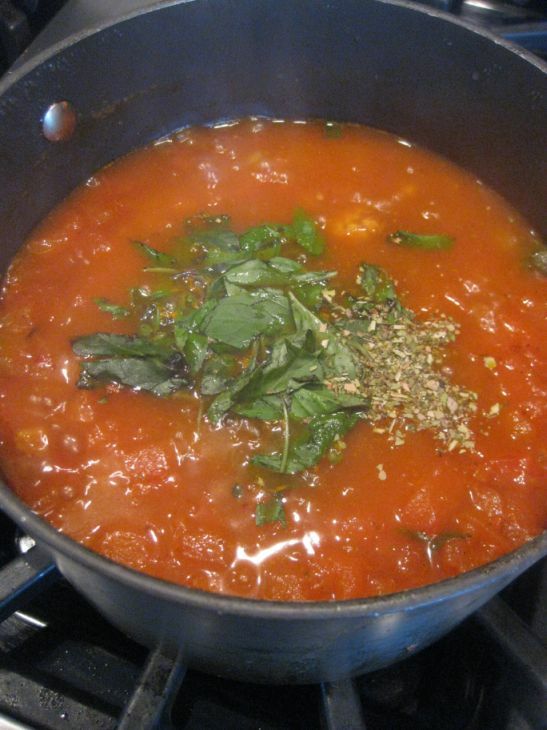 Add the basil and oregano the last 5 minutes of simmering. 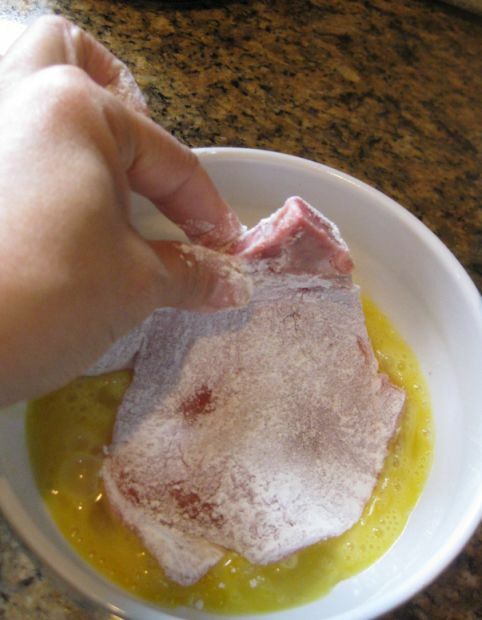 Clean your pork chop and season them. Place a pork chop between two sheets of plastic wrap. 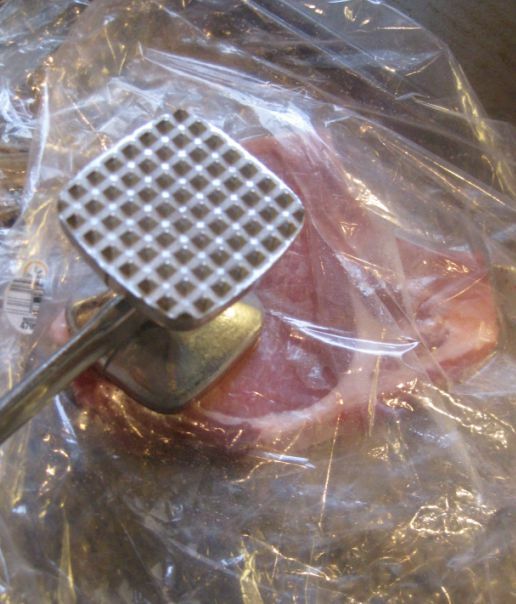 Pound the pork chop lightly with a meat mallet to a more of less even thickness. Spread out the flour, egg wash and bread cup in 3 separate plates. 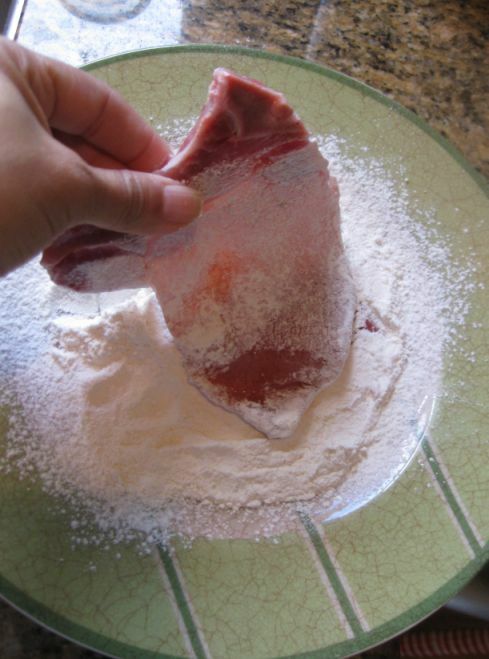 Dredge the pork chop in flour to coat lightly and tap off the excess. Dip the pork chop in the beaten egg and hold it over the bowl, letting the excess drip back into the bowl. 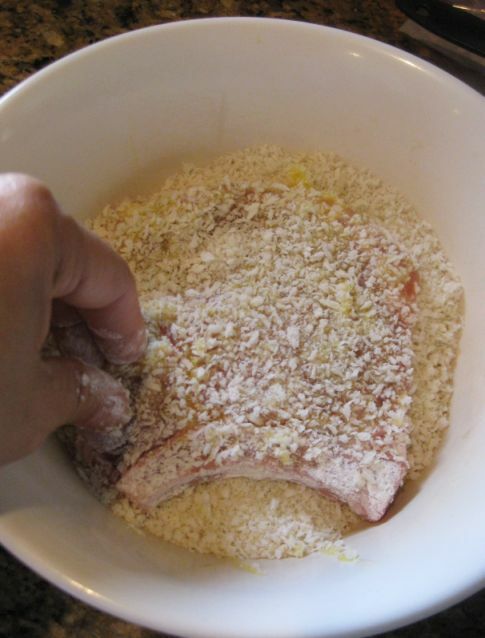 Transfer the pork chop over the bowl of bread crumbs. Patting gently and making sure that each pork chop is well coated with bread crumbs. 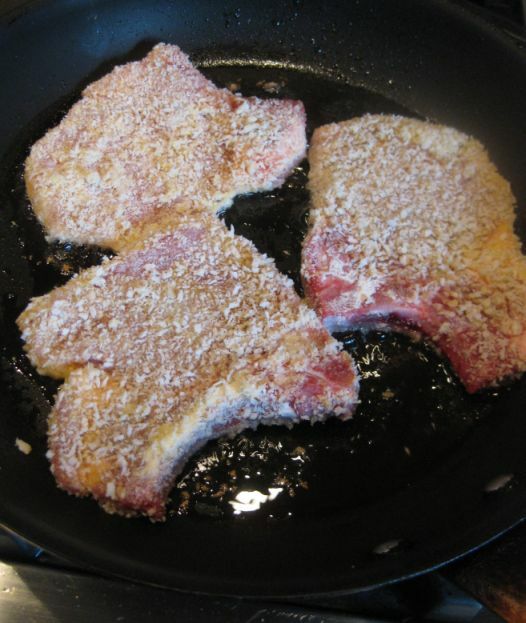 Heat the oil in a wide skillet over medium heat until hot and add the pork chops to the pan. Fry turning once, until golden on both side and cook through, about 4 to 5 minutes. 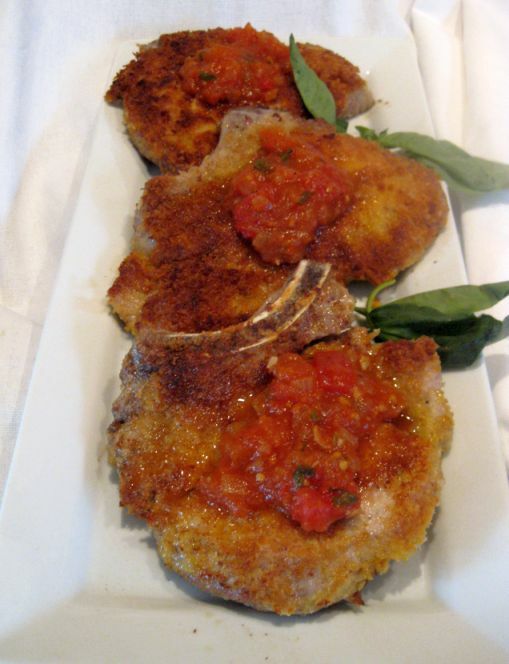 Put the pork chops on a platter and serve it with pasta and the spicy tomato sauce.